We strip, flagstone meticulously on our hands and knees using the finest techniques, and products available to date. 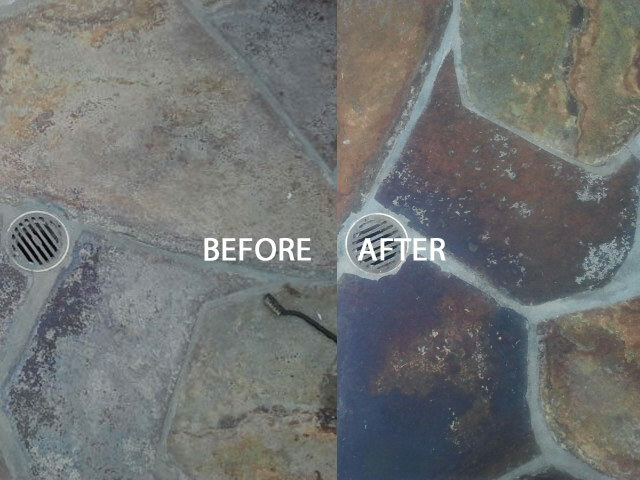 Flagstone is one of our specialties, because we remove all topical coatings, sealers, dirt, grime, residue as well as calcium, and efflorescence like none other . That is what separates California Tile Restoration from the competition. After we’ve stripped off the sealer, we wash off all the dirt and residue on our hands and knees, detailing it like you would get your car detailed. in our case, hitting all the nooks and corners along edges, under cabinets and any other hard to reach areas that machines can’t get to. Ultimately those are the areas that make an ordinary job, an Extraordinary job. Once we’ve got it stripped and cleaned, let it dry out completely. thats when we begin the sealing process. This is the final phase and you have four options of sealers you can use. You have a choice between a High Shine Sealer, a Low Lustre sealer, Penetrating Natural look sealer, and a color enhancing sealant. We recommend the high shine sealer if you desire the indoors / interior sealed, and the color enhancing penetrating sealer if you want the outdoors / exterior sealed to avoid staining and water damage. California tile restoration has restored flagstone throughout many cites in the golden state including Marin County, Sausalito, Mill valley, Belvedere, Strawberry, Tiburon, Mount Tam, Stinson Beach, Bolinas beach, Corte madera, Larkspur, Kentfield, Greenbrae, San anselmo, Fairfax, San Marin, Novato, Black Point, Pacheco Valley, Lucas Valley, Ignacio, Terra Linda, Santa Venicia, Peacock Gap, Glenwood and tomalas bay. San Francisco, Oakland, San jose, Sacramento county, Contra Costa County, Alameda County. submit a request for an estimate below.